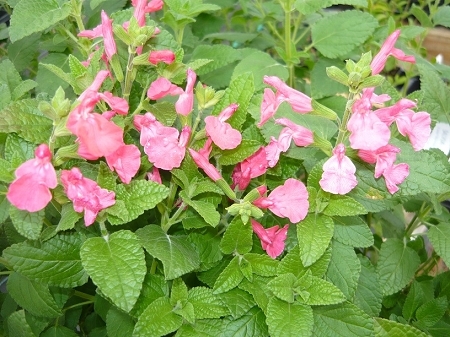 Wild Watermelon sage (s. microphylla 'wild watermelon) Beautiful salvia variety featuring watermelon pink flowers. Blooms throughout summer and fall and attracts hummingbirds and butterflies to the garden. Flowers are edible and can be added to salads, etc. or used as a garnish. Green fruity-scented leaves stay evergreen in the winter in zones 8-11. Perennial. Very heat and drought tolerant once established. Reported to be deer resistant, can get rather large up to 4'. Perennial zones 8-11. Live starter plant in 3 inch container.